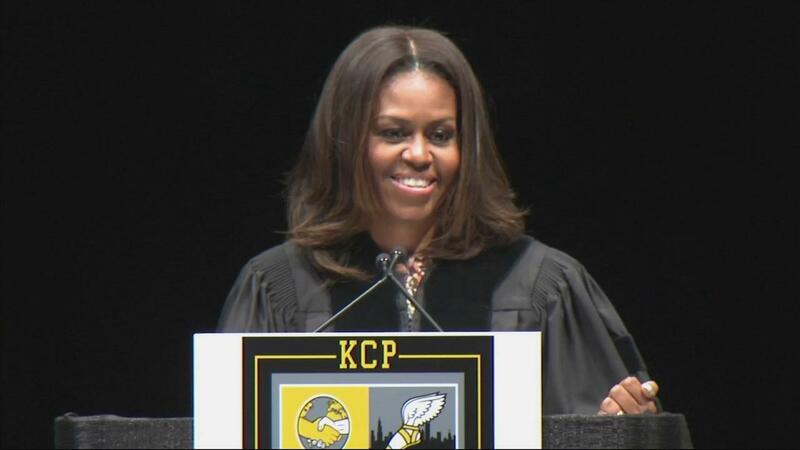 The 2015 graduating class of King College Prep High School in Chicago's South Side received a touching commencement address from First Lady Michelle Obama Tuesday. The school was selected from about 200 that submitted videos for Obama's FAFSA Video Challenge after she was "blown away" by their creative Scandal inspired submission. The moving address was personal for Obama who grew up near the school, and said she wanted to share "the real story" of the South Side, one of "resilience and courage in the face of adversity." King was the school attended by Hadiya Pendleton, who at age 15 was shot dead two years ago. The week prior to the shooting Pendleton, an honor student, performed at a D.C. event to celebrate President Barack Obama's inauguration. Pendleton was honored at what would've been her graduation ceremony. An empty chair was left for her, draped in purple, her favorite color, and decorated with flowers. Obama told the graduates she was most impressed by the school's impressive leadership and completion rate. All 177 graduates of the 2015 class have been accepted to college, the Chicago Tribune reports.